There’s a well-known and dreaded phenomenon called “The Sophomore Slump” that circles like a vulture over many an ambitious optimistic youngster in this world. It was initially coined to show how during a freshman year at school the student applies themselves to their work, worried about not being able to make the grade, and thus they manage to meet their potential or perhaps even surpass it. But once they’ve settled into the lifestyle of school they tend to relax their sophomore year and perhaps party too much, or just not take it quite as seriously, thinking they can skate by and consequently their grades suffer. The general belief seems to be the kid will turn things around as juniors and seniors when they start to take it seriously again and in the long run will be alright. The school example of the sophomore slump however is essentially predicated entirely on effort. Those who slack off will pay the price, those who keep their nose to the proverbial grindstone will maintain their GPA and not suffer a letdown in the least. So the better use of the term as it pertains to what we’re doing here on Spontaneous Lunacy is when it’s applied in the sports world. In sports what The Sophomore Slump refers to is that after a very solid, if not spectacular, rookie season, often one that was largely unexpected, a young player is prone to falling prey to a number of circumstances that derails his momentum considerably in Year Two. The reasons for this turnabout in good fortune are multitudinal. It might be that the opposing teams have used this time to better scout him and have discovered his weaknesses which they’ll now begin to exploit. It could also be that the heralded young player let the adulation for his breakout year go to his head and during the off-season was busy reveling in his newfound celebrity rather than working hard to improve on what he’d already done. In many cases it was simply that the kid was NEVER as great as he appeared that first year but rather that everything just fell into place perfectly for him, equal parts timing and luck. Once the laws of averages return to their normal levels time will show that he is merely serviceable as a professional, but hardly anything beyond that. With over a hundred years of sports of all kinds to look back on it’s truly amazing how frequent The Sophomore Slump happens. Sometimes the player rebounds from a disappointing second season and goes on to reclaim their stature – Willis Reed in the NBA, Willie McCovey in baseball, Nicklas Lidstrom in the NHL, Franco Harris in the NFL – Hall Of Famers all, each of whom had regressed in their follow-ups to exceptional rookie years. In other cases sometimes that first year was simply SO good, the player would be hard pressed to ever match it despite having a great career, like Wes Unseld and Fred Lynn who won both Rookie Of The Year and their league’s MVP in the NBA and MLB respectively their first seasons and while they remained stars, and in Unseld’s case became a HOF’er, the manner in which they burst onto the scene remains their career high point, the year they’re most remembered for historically. But in some cases a player’s strong first season was their one and only moment of stardom, a season spent building high expectations that would forever go unfulfilled. Ernie DeGregorio and Tyreke Evans in the NBA, “Super” Joe Charboneau and Mark Fydrich in Major League Baseball, Sam Bradford and Rashaan Salaam in the NFL, Alexandre Daigle in hockey all fall into this unfortunate category. Sometimes injuries are at fault for their subsequent downturn, sometimes it’s something else, or even nothing specific that can be pinpointed, but in retrospect it doesn’t matter, those solid starts to their careers makes everything that follows a disappointment and can wind up casting a long shadow over the rest of their lives. The same is true in music where an artist’s spectacular debut may in fact kick off a legendary career or wind up being just a career high point never to be duplicated. In some cases it’s merely a moment of serendipitous good fortune that soon hangs like an albatross around their neck as they struggle to break free of heightened expectations and a tendency in music to fall behind the curve while trying to recycle their initial glories. These eventual outcomes may not be entirely known until the athlete or artist’s career is over, or at least a lot farther along, but the best indication as to whether the person in question who suffered through an unrewarding follow-up campaign will ultimately be seen as a boon or a bust can be found in their third time out. After a great start to launch their careers how do they come back from the disappointment that followed immediately after? That’s the question surrounding Andrew Tibbs in the spring of 1948. 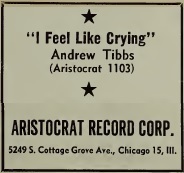 Tibbs debut back in December, 1947 was an impressive two-sided record that made enough noise to establish both him and Aristocrat Records as potential game changers going forward. For someone still in his teens Tibbs had shown remarkable talent both as a songwriter and a vocalist and neither side of that single had the indication of being a fluke, something that merely captured your attention because it was gimmicky or something so unique that he’d be unable to duplicate it. The top side, Union Man Blues, the first song he ever composed no less, was amazingly well-crafted lyrically and he delivered it an expert touch, letting his voice shade it in an understated manner without ever overselling its emotional content as young singers are prone to do in an effort to show off, especially those with pipes like Tibbs possessed. The flip, Bilbo Is Dead, may have been even more impressive in terms of ambition, even if the end results were slightly hampered by forces out of his control, as the biting protest he penned against the racist subject of the song needed to be cloaked somewhat so as not to provoke outrage amongst those in society who felt blacks should be seen and not heard. Both sides gave notice that Tibbs was a rising star and also positioned Aristocrat Records, only recently in business, as a label to watch, as their pool of talent from Chicago gave them a definite advantage over the abundance of labels making New York City (and to a lesser extent Los Angeles) their home, all fighting over the same local candidates for potential stardom. Aristocrat had Chicago – at least the black community in the city – almost to themselves and were already cultivating a good relationship with the many clubs that catered to the huge influx of black residents from the south, as well as the homegrown clientele which put them in good stead moving forward. Yet in February Tibbs’ much anticipated follow-up was a decided let-down. Drinking Ink Splink was not original enough, not humorous enough to overcome its lack of musical kick, and not well played nor arranged well enough to compensate for the shallow storyline and weak lyrics. It was an aesthetic failure as well as a commercial disappointment and with two such inexperienced hands – the label itself as well as Tibbs – there was no assurance they’d be able to turn things around and with the recording ban preventing any new experiments in the studio they’d be reliant on what he’d already laid down months earlier to right the ship. If they’d actually thought “Ink Splink” had been the best bet of his sides in the can with which to build upon his stellar debut then his immediate future hardly seemed promising. Would this be one of rock’s first cases of a one-hit wonder? Fear not for this is tremendous. The heavy handed piano triplets kick this off in promising fashion. Though I Feel Like Crying, as made clear by the title, is a mournful song Tibbs’ vocal chords sounds positively liberated. His sinewy voice, definitely indebted to Roy Brown but possessing an even more delicate delivery at times, breaks free of its shackles from the first few times we heard it and lays on the emotional gravitas from the beginning. He rises and falls in tone with effortless grace, “worrying” lines like the best gospel lead (remember, he was trained in gospel as a kid under Mahalia Jackson’s tutelage) and conveying the emotional burden of a man who lost his one true love as effectively as we’ve seen thus far in rock ‘n’ roll. You knew he had it in him, even from the relative disappointment of his previous release, where his voice, his delivery, his sheer skills were never in question, but he was hamstrung by circumstance. It was obvious he just needed the right part to play on the right record and this is definitely… unquestionably IT! Forlorn ballads don’t always get quite the respect they deserve in rock’s big picture, in part because they’re not the kind of communal celebrations that the best uptempo romps are, nor do they possess the type of longing urgency of the greatest pleas of love, but when you hear them, and are in the right frame of mind to appreciate their stark qualities, they pack an emotional wallop all the same. Tibbs plays his role here like a seasoned veteran, someone who’s been down that dark, lonely street and knows its terrain all too well. He chooses his steps carefully, never overdoing it, refusing to let this simply turn into a cathartic exercise in grief. Instead he opens up enough to let you feel his hurt, but then keeps the rest of it under wraps, struggling to maintain his composure before having to turn away as the screen fades to black. It’s a bravura performance and not surprisingly the song that broke him into the national consciousness, at least “officially”, as it became his first, and only, record to make the still skimpy Billboard Race Charts. But recognition for its commercial impact aside, the real recognition he’s earning with each line sung is that, already acknowledged as one of rock’s best “voices”, he’s now showing he’s also among its greatest thespians, delivering a wholly authentic performance in a very difficult part to play. The broken-hearten lament of despondent and emotionally ravaged lovers will go on to become one of the genre’s most challenging roles, one tried by a long list of the biggest names rock ‘n’ roll has ever seen, from Clyde McPhatter, Little Richard and James Brown to Roy Orbison, Jackie Wilson and Axl Rose. But anyone praising the efforts of those men – and lots of others – in future decades who attempted to step into this often tricky persona for a song or two in their canons will have to at least acknowledge that Tibbs nailed the part back when rock was still largely playing in off-Broadway theaters. Now it has to be said he’s aided mightily by the right supporting cast for a change, a welcome departure from so many early rock releases when the session players are an outright hindrance at times. Here the band keeps things tightly restrained behind him, the horns drawing out their parts in sorrowful fashion with the piano filling in with brief stop-start shifts in moods. Very sparse, but entirely effective in lending the proper atmosphere to the production. But what you’ll come away talking about, no matter how good the scenery looks and how vital the director’s light touch, is the masterful performance of Tibbs himself in the lead role. Every emotional nuance needed is hit on cue. When he draws out “Chiiiiiiiiiiiiild” is his light breathy range at 1:13 it’s breathtaking. The earthier sax solo that makes up the break 2/3rds of the way through leads to his big scene kicking off with an urgent “BAY-BEE, BAY-BEE, BAY-BEE” as he follows with his most impassioned vocal yet, then pulls back with aplomb to draw you in even closer for the payoff. By the time he swells in volume once more for the finale you can feel the theater about to erupt with applause. This is a great record in every regard, an All-Star performance all around, and for Tibbs’s still evolving career it was definitive proof that rookie campaign was no fluke and that his second outing wasn’t cause for too much concern after all. While he might not wind up in the Hall Of Fame after his up and down first two efforts like an Ozzie Smith or Pete Maravich would, this at least assured he wasn’t going to become Bob Hamelin, an enduring punch line for futility following a promising start. Maybe after regaining his footing he’d just wind up with a solid career like an Otis Thorpe or Troy Tulowitzki did after their sophomore slumps, but then again Tibbs’s career at this point is still far from over and so we have a ways to go before we know for sure what his ultimate fate will be. In the spring of 1948 though I Feel Like Crying gives plenty of reason for optimism looking forward. With the recent upswing of instrumental rock releases carrying the weight for the entire genre this reinforces the importance of the vocal side of the equation in rock’s emerging story and is without question the best vocal performance we’ve heard around these parts in months, validating the expectations we had on Tibbs the first time we heard him. He’s got it in him to be a superstar and from now on that’s what we’ll expect. Leave a reply on "Andrew Tibbs: “I Feel Like Crying”"